During my recovery from AML have have been doing lots of research into Leukaemia so decided to write this post. I’ve always loved researching and finding out the history behind something, although it is not something nice I still found it extremely interesting! So for those of you who’s also like to know please carry on reading! From historical literature is appears that problems with a patient’s blood leading to their death was known about long before the first published description of Leukaemia. The first time this crops up is when French anatomist and surgeon Alfred-Armand Velpeau wrote about it in 1827. 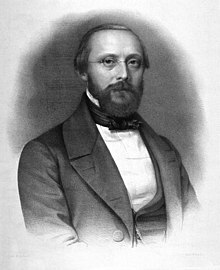 The name we now know it by was coined by the renowned German pathologist Rudolf Virchow in 1845, he was only in his 20’s at the time! He was a pioneer in the use of the light microscope in pathology and the first to describe abnormally high amounts of white blood cells in patients. Virchow named the condition Leukamie which he formed from two Greek words; Leukus – meaning white and Haima – meaning blood. At the time he wasn’t sure of the cause of the excess white blood cells so used purely descriptive words. Also in 1845, Edinburgh pathologist John Hughes Bennett was the first to diagnose Leukaemia and over the next 20 years Virchow and Bennett fought over what caused Leukaemia as they believed in different causes. We now know that that Virchow was the one who was correct as he believed it started in the bone marrow. Bennett used the term Leucocythemia to describe the condition of patients who had died from enlarged spleens and who had changes in ‘colours and consistencies of their blood’. About 10 years after Virchow’s findings it was discovered by Franz Newman, while studying the bone marrow of a deceased patient, that it was an unusual colour and not red as it would normally be. This lead him to work out that it was a bone marrow problem causing the abnormality in the Leukaemia patient’s blood. In 1869 he first used the word ‘Myeloid’ from the Greek word Myelos – meaning – bone marrow as he’d recognised that white blood cells were made in the bone marrow. In 1879 Mosler first described the examination of bone marrow to diagnose Leukaemia. Wilhelm Ebstein, in 1889, came up with the term Acute Leukaemia to differentiate between rapidly progressive, fatal forms and the more slow growing Chronic Leukaemias. In 1900’s the Myeloblast (the malignant cell in AML) was characterised by Naegoli who divided Leukaemias into Myeloid and Lymphocytic. In 1913 four types of Leukaemia were classified. The American Pediatric Pathologist Dr D Farber discovered the first effective Leukaemia treatment in the 1940’s. However, it still remained a largely fatal disease with all patients dying eventually. In 1958 the use of combination chemotherapy was pioneered in the US and is still the mainstay of treatment. In 1960 it is discovered that the Philadelphia chromosome is linked to Leukaemia leading to the first ever targeting cancer treatment. In 1960 the blood cancer charity Bloodwise formerly known as Leukaemia and Lymphoma Research was formed by the Eastwood family who sadly lost their daughter Susan aged 6 to the disease. Bloodwise are responsible for many advances in blood cancer treatment, in fact if their daughter had suffered her Leukaemia today she would most probably have survived as now 9 in 10 do whereas in 1960 it was 1 in 10. Finally in 1970 it was confirmed that some patients could be cured and by the 80’s and 90’s cure rates were significantly improving. In 1979 the first successful unrelated stem cell donor transplant took place for a patient with Leukaemia. Sadly the patient passed away from recurrent Leukaemia two years later, but it proved these transplants were viable and as we now know these are now largely successful. In the late 1980’s scientists find that exposure to the chemical benzene is associated to the increased risk of developing some Leukemias. AML was the first ever cancer genome to be fully sequenced in 2008 (Genome meaning a full set of chromosomes, the inheritable traits of a cell). Since Dr Farber discovered the first viable Leukaemia treatment there has been huge advances in knowledge, understanding and treatment. Hope you enjoyed with little ‘snapshot’ of the history of Leukaemia, I certainly enjoyed researching it! Next Post Statistics ~ How relevant are they?